Meanderings and Muses: Good News - Yay! In September 2009 I was doing happy dances all over Meanderings and Muses because an essay I had written was accepted for publication in the wonderful anthology "Clothes Lines." Well - Guess What - I'm doing more happy dances - Yay!!!!! 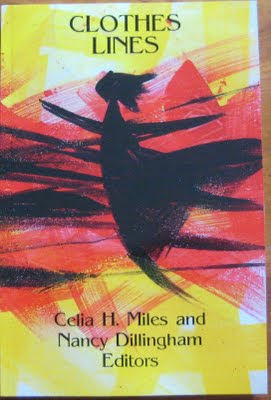 Celia Miles and Nancy Dillingham are doing another regional anthology. Sadly, they say this is their last one. (Personally - I hope that's not so). These women, wonderful writers in addition to being excellent editors, have done some pretty amazing things - not least of which includes their efforts in nurturing women writers. I, for one, seriously doubt that my work would have seen the light of day without Nan and Celia. They hold a special place in my heart. More than they know. But I'm going to save the mushy stuff for another day, another blog. You'll hear more about Celia Miles and Nancy Dillingham. I'm hoping to convince them to allow me to profile them here. Today I'm doing happy dances again because I'm one of the lucky women who will be contributing to this newest anthology. It's to be a collection of stories, reflections, memoirs, poetry –all having to do with women's spaces and places. "Where do you, have you, wish you could… find yourself most comfortable, at home, free to be, free to think, reflect, escape, rejoice, renew? An apple tree when you were seven? Your therapist’s couch? 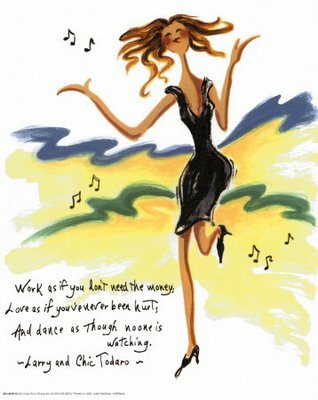 Your dreams of dancing on a faraway beach? Actually dancing on a faraway beach? Your kitchen with your arms in dishwater? You can deal with inner space, outer space, filled space, empty space; with the psychology of space; with places you’ve been that have special significance for you--whether spiritual, sensual, artistic or intellectual." I am over the moon happy about this news, and quite honored. So - join me in a happy dance, won't you?! I'm happy dancing with you, Kaye! Wonderful news! Wonderful news, Kaye, for you and the editors, but also for readers. Congratulations!!! WoooHoooo!! Happy dancing for you. Oh, wonderful news Kaye! Definitely time to do the happy dance. Congratulations. That's fabulous, Kaye - and well-earned, too. Congraatulations - now you just have to tell me where I can buy it! Happy dancing with you and for you! Oh, Kaye!You deserve that happy dance. Isn't retirement great? Now, you can really enjoy that!